Ah Park City in the off season- beautiful blue skies, sunny crisp weather, snow capped mountains… and construction EVERYWHERE. I feel like the city votes that September through November will be the months they rip up every road, pipe and drain in the town, all at once and inconveniently detour you or make you wait in traffic. The only other place you can travel 1/2 a mile in 25 minutes is New York City during rush hour and the roundabout at Deer Valley. The good news, you can go to the farmers market at the Canyons and buy a butternut squash the size of a small baby. 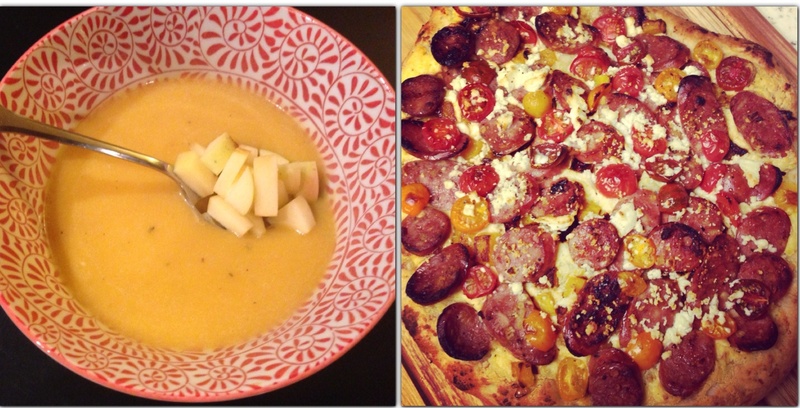 Seriously, I bought one butternut squash and I was able to make three separate recipes with it: Soup, Pizza and Pasta! 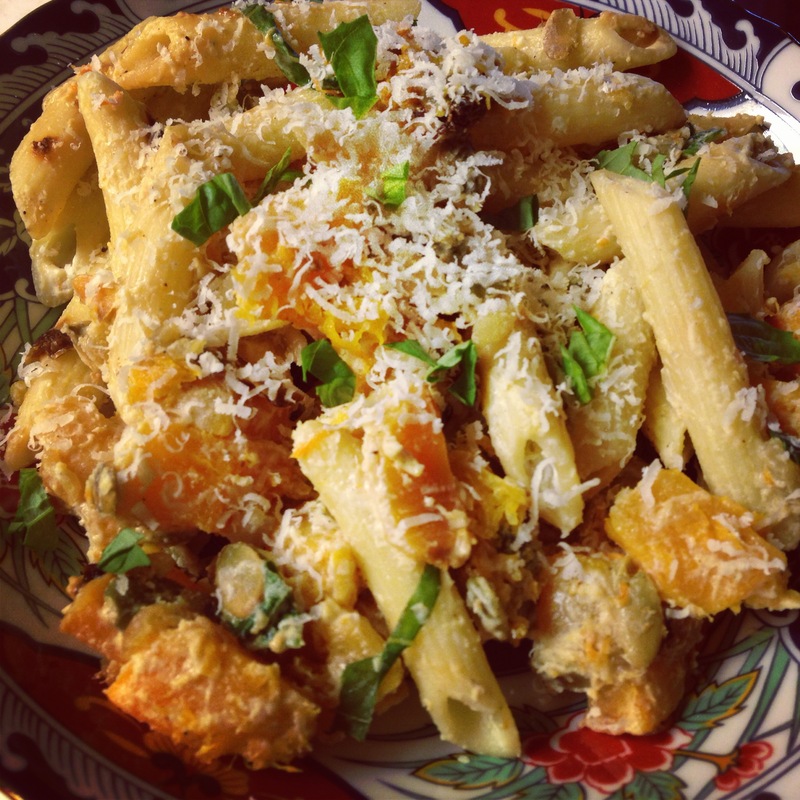 This recipe was adapted from my favorite little Italian chef, Giada. It’s actually quite genus and I wish I could say I came up with the technique. Pasta water and goat cheese combine to make a creamy and delicious sauce with little effort! 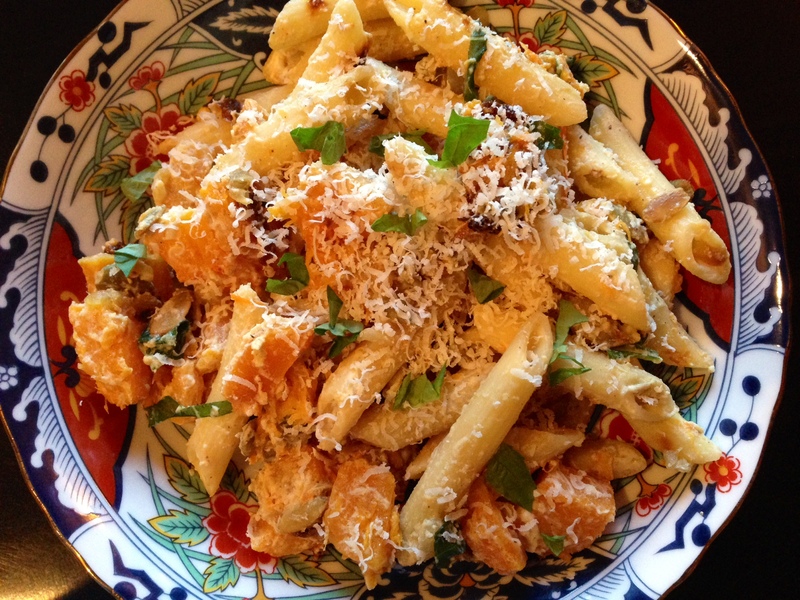 The roasted squash and onions caramelize in the oven before they are tossed with the creamy penne and fresh basil. The last touch, toasted little pepitas that lend a lovely crunch. The original recipe called for walnuts but I much prefer the delicate flavor of the pumpkin seeds with this pasta. I am always looking for tasty and filling vegetarian recipes to have on hand- vegetarian or not, this recipe is definitely one of my go-to, crowd pleasing pasta dishes! Enjoy! 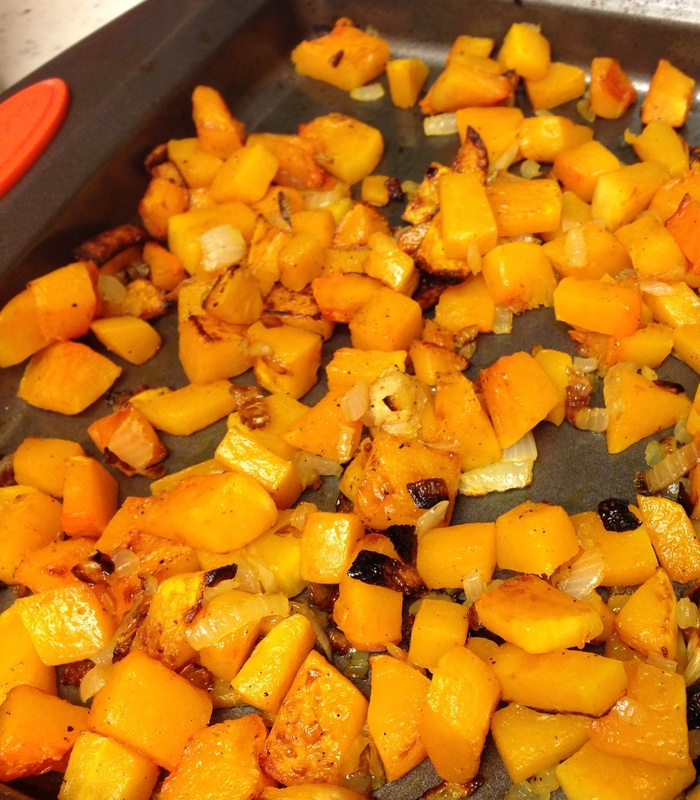 Chop onion and squash, mix together in a bowl and drizzle with olive oil, season with salt and pepper to taste (just enough oil to lightly coat the squash 1-2Tbls.) Arrange in a single layer on a prepared baking sheet sprayed with vegetable oil cooking spray. Bake for to 40 to 45 minutes, tossing occasionally, until the vegetables are golden and cooked through. Remove from the oven and set aside to cool slightly. While the squash mixture is cooling, bring a large pot of water to a boil over high heat. Add salt after the water boils then add the pasta and cook until tender but still firm to the bite, stirring occasionally, about 8 to 10 minutes. Reserve about 2 cups of the pasta water before draining the pasta. Put the pasta, goat cheese and 1 cup of pasta water in a large serving bowl. Toss until the cheese has melted and forms a creamy sauce. 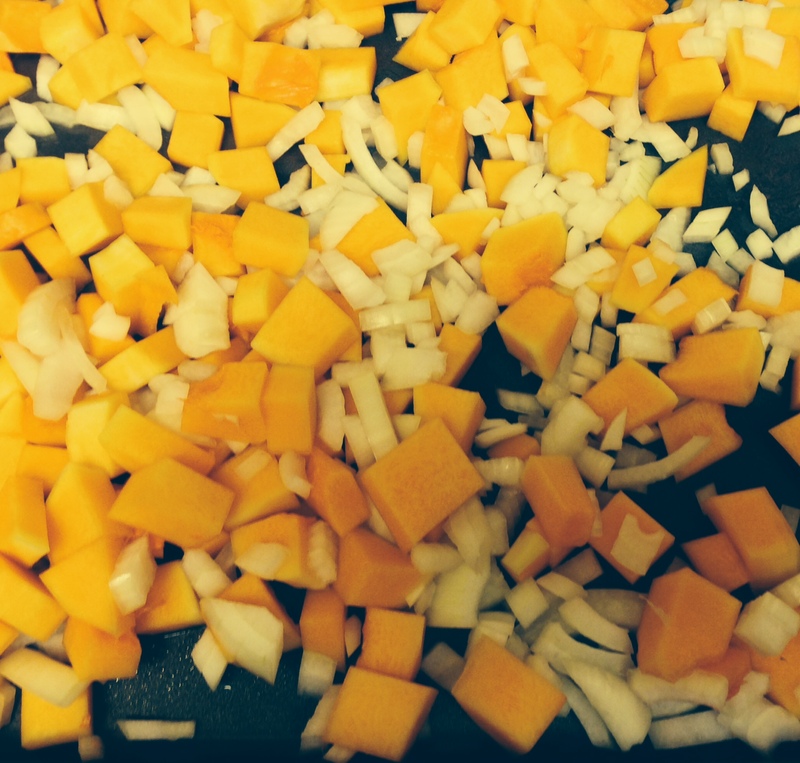 Add the squash and onion mixture, the pepitas and the basil. Toss well and season with salt and pepper, to taste. 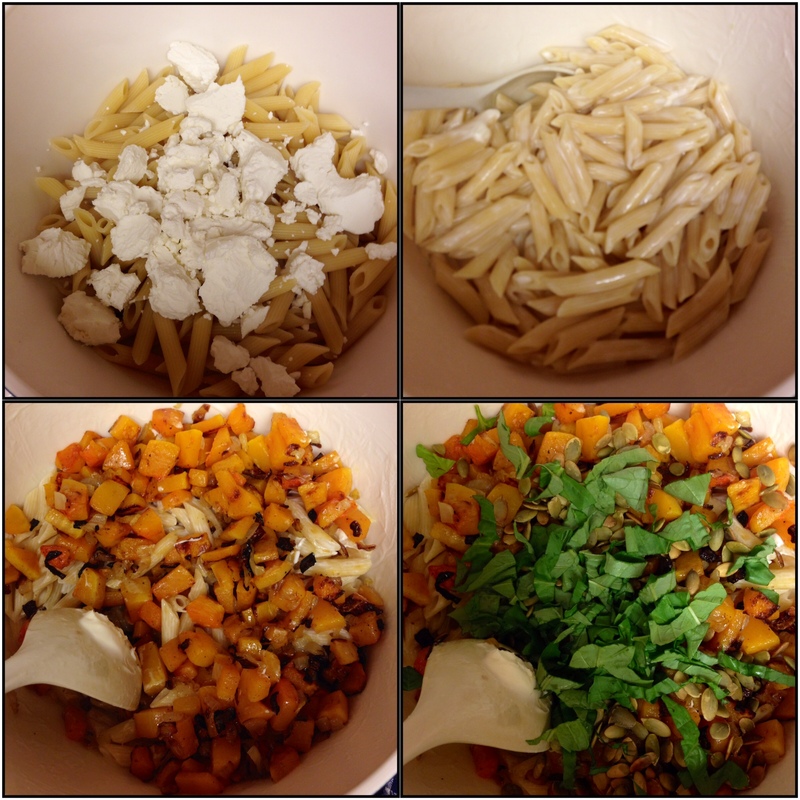 This entry was posted in Entrees, Recipes and tagged Butternut squash, goat cheese, Penne, roasted butternut squash, Vegetarian by skibootsinthekitchen. Bookmark the permalink.